The most revealing and at the same time the confusing chart is the months of supply. For the last four years this has been a fairly smooth curve with as low as 2 -3 months of supply under $600K and years of supply over $10M. Take a look at the chart below showing months of supply as of Friday, April 24, 2014 and check out how ragged it lots. Let’s take a quick run through the price ranges to see what may be happening to the Greenwich market in 2014. Under $800 – This section is competitive, but sales are actually lagging a little compared to 2013. Last year we saw this price range with 2 and 3 months of supply. There are plenty of buyer’s out there in this price range. (My new listing at 49 Center Drive in OG has had 14 showings 2-1/2 days.) Looks like what we have may be a little picked over resulting in less sales velocity. $800K – $1.5M – This market segment has seen a bunch of new listings and it takes buyers awhile to burn through the new inventory. Expect to see months of supply drop back to 6 months of supply and under in the next few months. $1.5M – $5M – This is where the market has really changed. We used to have lots more months of supply when you hit $3M+, but this year from $2 – 5M we have had about the same 13 months of supply throughout this price. So far in 2014 61 sales out of total 133 sales have been in this price range. This is now the heart of the market. One reason maybe that the financial industry folks that predominate in this price category are now “fully-bonused” with delayed compensation from prior years and their stock awards appreciating with the rising stock market making the $3M+ house in Greenwich look attractive. Over $10M–This category is astounding! Rarely have we seen such a sharp change in demand. Last year at this time months of supply was over 6 years and that was only if you counted the one contract we had. So far in April we have had three properties sell for over $10M including an all-time U.S. record house sale of $120,000,000. Contracts are looking good too. We now have six contracts for houses over $10M for total 12 houses sold or under contract. If you annualize this month’s sales you are looking 12 months supply as the inventory in this category has dropped to only 36 units available. This 12months of supply is a faster sales rate than the $1 – 1.5MM price range. We have 79 open houses and the Forsythia, Dogwoods and Daffodils are out! Driving around Greenwich leads to some really beautiful views so it’s a good time to go for a drive. If you do go I’m having an open house in Old Greenwich from 2 – 4:30 pm at 49 Center Drive in Old Greenwich just off Sound Beach Ave. At $779,000 in OG is should go pretty fast, so feel free to stop by. The open house prices range from $469,000 to $6,195,000.The good news is that the times are staggered for many homes which gives you an opportunity to plan your route and see as many as possible. 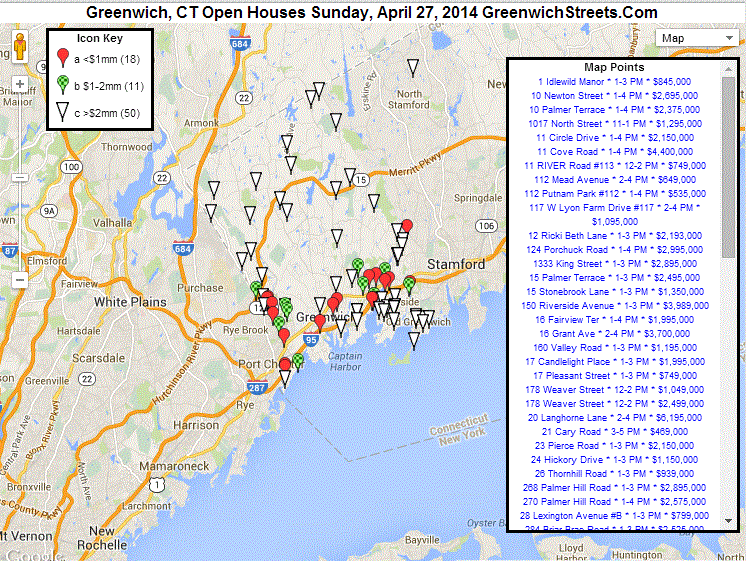 The Open Houses span all areas of Greenwich. If you are looking under $1M you have 18 choices, several having their first open house. If you are looking over $2M you have an amazing 50 properties to choose from. Check out the interactive map and the schedules to plan your afternoon. Please click here for the interactivemap. The static map is below. Thanks to Rob Pulitano for doing yeoman’s work to pull together all 79 Open House and the interactive map. Thanks to Pam Toner for the hot links and the Word document attached. The Word document prints out betterif you are looking for something to take with you in the car. You can see my market analysis below. It’s worth taking a look at, the market trends we are seeing are much different from anything we have seen in the last four years. John Christeroffersen of the Associated Press has a very good article about the rise in sales over $10 million homes in Greenwich and was nice enough to quote me. The article has appeared from coast to coast showing the continuing interest in Greenwich and the high end market. Our inventory of over $10 million listings is actually starting to deplete and months of supply is rapidly declining. In March of 2013 we only had one contract which with 44 active listings gave us 189 months of supply or over 15 years. As of today 4/16/13 we have 10 sales and contracts and only 38 listings. Our months of supply is down to 22.8 months or less than two years of supply. The other interesting thing about sales this year are where they are in Greenwich. Six of the ten properties are in backcountry Greenwich, the traditional home of Manhattanites looking for a weekend place. Backcountry Greenwich is less than an hour from Manhattan. Even on a Friday in the summer when the roads to the Hamptons are packed you can hop a Metro-North train and be by your pool in 75 minutes. The great thing is all of these houses are gorgeous and each one is different. In this price range buyers are very particular and they may find that their options are actually very limited. If you want to live on Long Island in Old Greenwich you only have two choices in this price. So if you are interested in seeing one of these houses before they all disappear give me a call at 203-969-7900. As reported last week, 2014 has been a different year than the three proceeding years. The two charts that show this best are below. The first pie chart shows first quarter sales. In the last couple of years the segment under $1 million was a small part of the inventory, but they represented a much larger portion of the sales. We see this somewhat in 2014 as the first three pie pieces are a little bigger in the Solds chart than in the Inventory chart, but not that much bigger. If you look at the inventory chart and compare the width of the pie slices you can see that the standout section is the $2 – 3 million (ochre slice). It represents more than a quarter of sales, but less than a fifth of inventory. The other segment that stands out is the $1 – 1.5 M price range which has been selling well in Greenwich for years. This price in prior years has been a fraction of sales. Now the $3 – 4M segment and the $4 – 5M sales slices are actually bigger than their inventory slices showing accelerating sales in these price ranges. It’s only when we get over $5M that we see the sales rate at less than the inventory. Having said this these categories were nearly none existent last year at this time. So far this year sales over $5 M represent 8% of our sales. When you look at sales in March and pending contracts you can see that sales in low end under $2 million are rebounding from earlier this year, particularly in the $1.5 – 2.0M range. The good news for the high end is that we have contracts represented in every price range with the $3 – 4M price range looking particularly good. This weekend presents a major effort to show off as much inventory as possible due to the holidays that start next week. There are 49 Open Houses scheduled for Sunday, April 13th. The prices range from a $4,000 per month rental to a single family home for $6,500,000. The Open Houses span the full acreage of the town of Greenwich and into Stamford, from 31 Scott Road in Banksville to 7 Charter Oak Lane in Byram and up to Shippan in Stamford. Check out the interactive map and the schedules to plan your afternoon. Thanks to Rob Pulitano for preparing the list of Open Houses and the interactive map and to Pam Toner for the hot links and the Word document attached and to Mark Pruner for the market analysis. The Word document prints out nicer if you are looking for something to take with you in the car. The buyer of Copper Beech Farm is The Conservation Institute, LLC. This Connecticut LLC was formed on 4/2/14, presumably to purchase the property. The LLC is managed by Jonathan Whitcomb of Diserio Martin in Stamford as reported by the New Canaanite. The price is still a surprise to many in the community. So the identity of the Conservation Institute is still a matter of major speculation with some wondering whether this has anything to do with owner’s forestry properties in Montana. 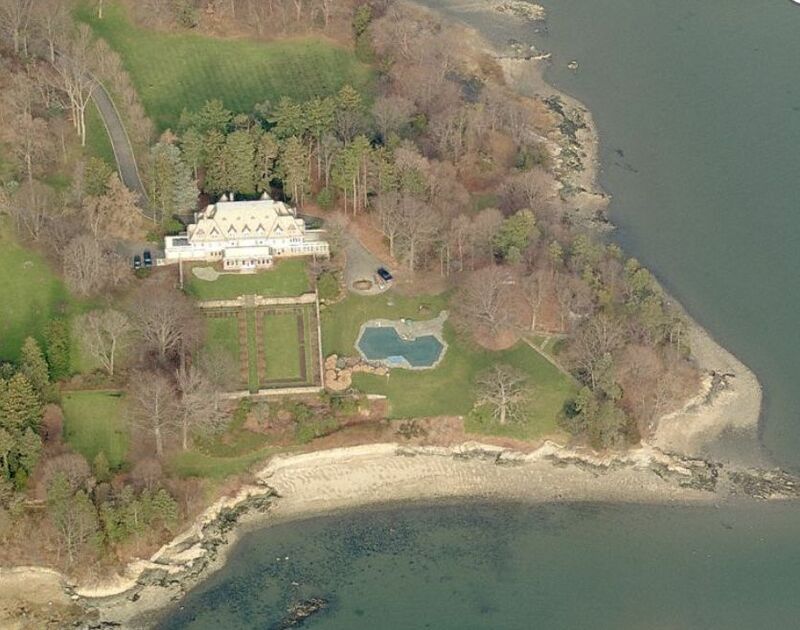 The Greenwich MLS just listed Cooper Beach Farm at 499 Indian Field Road as having sold $120 million. This 50 acre Greenwich waterfront property included two small islands in Long Island Sound. David Ogilvy of David Ogilvy & Associates was both the listing and the selling broker. The 12 bedroom 7/2 house was constructed in 1898 and has 13,519 s.f. of above ground living space. While a beautiful house that was renovated in 1985 it was a period piece with no central air conditioning. As a result the bedrooms with best views in the house were the servants bedroom which were directly below the roof. The 50 acres property is in a 2 acre zone which with a 15% subdivision set aside as required in Greenwich could theoretically allow 21 lots many with direct waterfront exposure, but when roads and other amenities are added there would be fewer lots. Certainly, the future use of this property will be the talk of the town for the next week. If you just look at total solds graph below, sales are down after the tough winter, but they are up compared to last year in our mid-market $2 – 5 million. The $3 – 5 million market is also getting tighter with months of supply less than an year in what for anywhere else would be the high end m arket. Our under $1 million market is supplied constrained and what is there is a very picked over market. 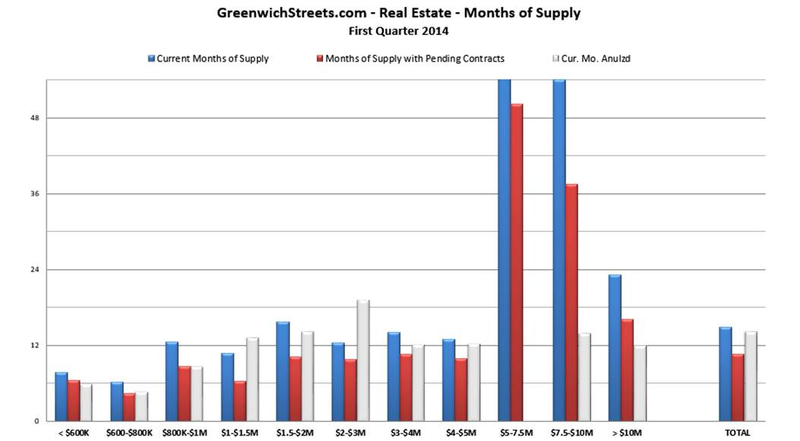 Sales Mostly Up & Some Down – Greenwich real estate had a stellar year in 2013 with 724 single family homes sold nearly the same as the 729 houses sold in the boom year of 2006. What had changed post-recession was the mix of sales with houses under $2 million dollars doing better as well properties closer to town. Many buyers now want to be closer to their neighbors with a house on a main road. After March Greenwich sales stayed well above average until the U.S. government shutdown through a kink in September sales, but it only pushed sales into October. January 2014, normally a slow month was excellent then the hard winter slowed sales somewhat in February and March. From 2010 to July 2013 the Greenwich house market was very consistent with a seller’s market under $1.5 million and a buyer’s market over $3 million. This changed with record highs in the market and the election of Mayor de Blasio. So far in 2014 we have seen $3 – 4 million homes sell almost as fast as houses under $600,000 homes. We’ve also seen the months of supply of over $10 million dollars home cut in half as financial company buyers become “fully bonused” with deferred compensation and their appreciated stock rewards from prior years accumulating vest in larger amounts.